Engrave your personal message on a Double Tile located in the Lobby/Entryway floor of the Mission Hills-Hillcrest/Knox Library with the order form below. A Double Tile is 23.5" wide X 11.5" high and allows for a four line message (up to 28 characters per line). You can also include your name on the Donor Wall that will hang around the Library's entry doors. 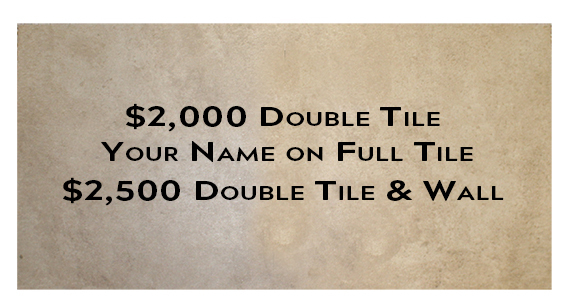 Visit HERE if you are interested in Tile naming opportunities (half the size of Double Tile). Visit HERE for information on additional recognition opportunities. Visit HERE to download an order form to mail in. Contact Library Foundation Major and Planned Gifts Director Natalie Ganz by email or at 619-238-6643 for more information. What do you want your Double Tile to say? Engraved Double Tiles are limited to a maximum of four lines with a maximum of 28 characters per line, including spaces. No special characters or symbols please. If you use less than four lines, your message will be centered on the tile.